To call these remarkable spirals "Devil's Corkscrews" seemed fairly appropriate, in view of the total lack of explanation for them. Always it has been customary to attribute whatever was inexplicable to Satanic origin; and, besides, how is one to account for the making of a twisted pillar 15ft. or more in height, as mathematically formed as any ordinary corkscrew, out of quartz rock, without intervention by some sort of artifice? Plainly, from the popular view-point, some supernatural agency must be responsible for the phenomenon in question, which is known to the better informed as a "fossil twister." The spirals are fossils - of that there can be no doubt - but, rejecting the theory of diabolical agency in their manufacture, scientists are eagerly inquiring what they were, animal or vegetable, when they were alive. They must be of animal origin or plant origin - the question is, which? Some theorists have been of the opinion that they were petrified vines, but who ever heard of a vine that climbed in a mathematical spiral? Others suggested that they were fossil worms of huge size - a most ingenious and even plausible idea. In a region known to have been inhabited formerly by many gigantic species of reptiles some of them 90ft. in length - whose remains are dug out of the rocks in the Bad Lands today, why should there not have been exceptionally large worms? Nay, why should these worms not have been of mathematical habit, erecting themselves spirally, while waiting for food, in the exact perpendicular, and becoming fossilized eventually in that somewhat strained and uncomfortable attitude? However, the belief that really stuck, find­ing many confident and even enthusiastic advocates, has come to be known as the "gopher hole theory." In parts of the West a small rodent animal, of subterranean habits, known as the "gopher, " does immense damage to crops by eating the roots of grain and other cultivated plants. Ages ago, declare the endorsers of this idea, gophers of a prehistoric breed made their home in the region now known as the Bad Lands, and, after the manner of their kind, dug burrows. Obeying a mathematical "instinct," they excavated their holes in perfect spirals, and, in the course of a thousand centuries or so, these burrows, long vacated by their original owners, were filled in with silica from water which overflowed them, thus reproducing the form of the "corkscrews" in solid quartz, to be exposed to view in modern days through the wear­ing away of the hillsides by wind and rain. The essential point of evidence required to back up this theory was seemingly. fur­nished not long ago by the dis­covery of the bones of a real gopher buried actually in the sub­stance of one of the quartz cork­screws. This, everybody said, proved the case, and the advocates of the gopher idea simply sat back and smiled a superior smile; there was nothing further to be demonstrated. But, alas! not long afterward, fossil parts of a deer were found in another quartz spiral, and it had to be admitted that no member of the deer family ever was a burrowing animal. So the question was again admit­ted to be open to argument, and Professor. 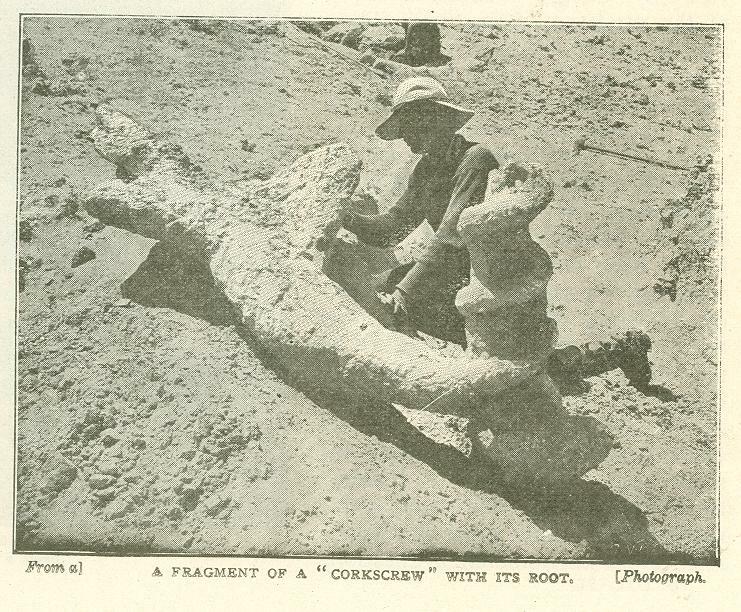 E. H. Barbour, of the University of Nebraska, long a conservative opponent of the suggestions previously entertained, stepped forward with what has at the present time every appearance of being the true story of the origin of the mysterious screws. 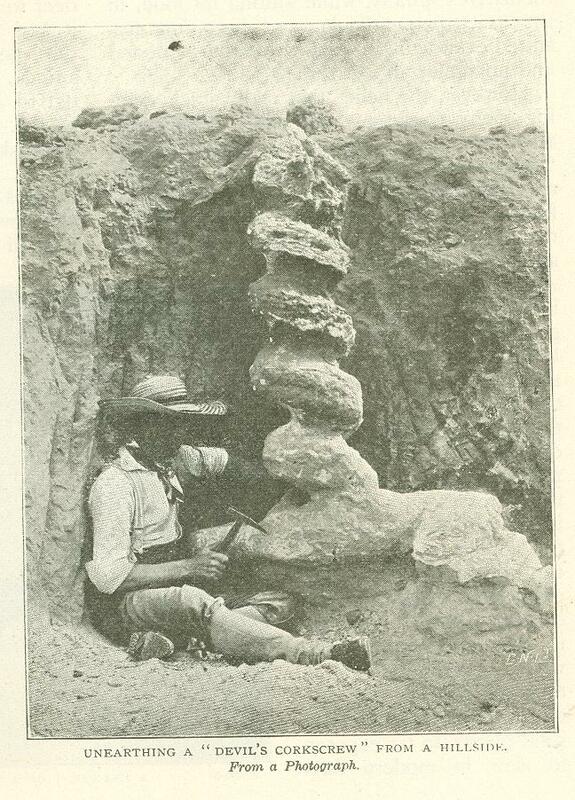 It seems, according to his account, that­ as is understood by all geologists - the great basin to the east of the Rocky Mountains; including the area now called Nebraska, was a vast lake a million years or so ago. That was the epoch known as Miocene, when as yet the North American continent was in process of formation. On the bottom of this freshwater sea, at a depth of hundreds of feet, grew immense numbers of water­weeds of a species unknown today. They were of gigantic size, some of them 20ft. or more in height, and they assumed the form of huge spirals, mathematically exact in their curvature. It is imagined - though of this there is no positive proof - that each one was , made up of a group of plants, together form­ing a sort of community. Rivers brought into the inland sea immense quantities of detritus, and this was deposited on the bottom of the lake so rapidly that whole fields of the giant water-weeds were buried beneath it. In the course of ages the lake bottom became dry land, and incidentally the plants, decaying, were replaced, particle by particle, by silica de­posited from water which contained it. 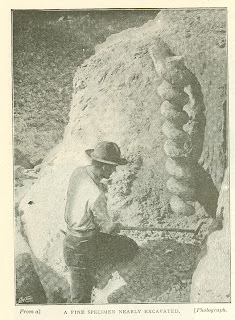 Silica, of course, is the material of quartz, and thus it is that the so-called Devil's Corkscrews were formed, reproducing in rocky sub­stance the vegetables from which they originated. Weathered out from the cliff-sides in these later days, they stand in rows like sculp­tured pillars twisted into spirals. Unlike ordinary corkscrews, they turn not all one way, but are right ­handed as often as left handed. Anybody might well suppose them to be works of art, so graceful and elegant are they. Some of them wind about a vertical axis, like a vine around a stick, but others are free. The typical Devil's Corkscrew consists of two parts - the screw, already described, and a massive "root," sometimes, as big round as a hogshead, which branches off from the lower end of the spiral. 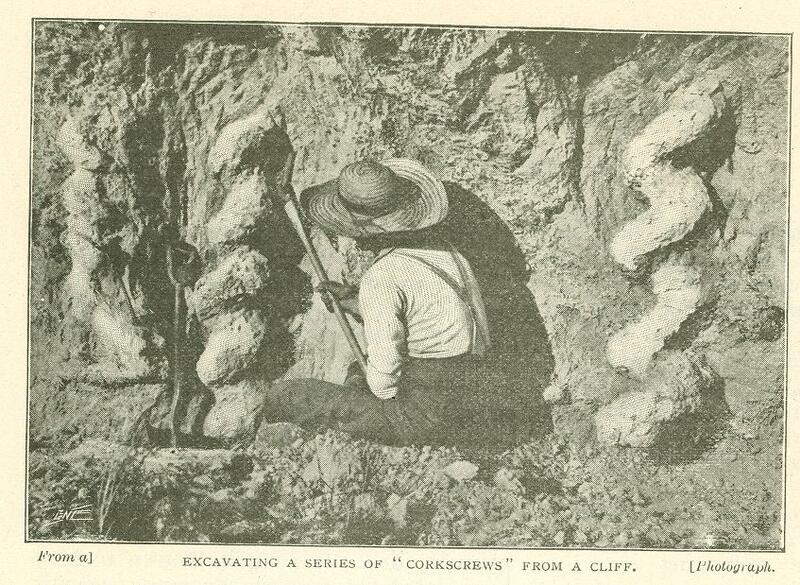 In a large specimen the screw may be 15ft. long, while the "root" attains a length of 20ft. Advocates of the gopher theory contend that the rodent's nest is represented by the "root," while the spiral stands for the passage of communication with the surface, of the ground. This delusion, however, may now be regarded as thoroughly exploded. Professor Barbour himself admits that his water-weed theory may not be correct, but challenges anybody to offer a more plausible suggestion to account for this most curious of geological freaks. During several years past the University of Nebraska has sent an annual expedition to the corkscrew bearing region, all expenses being borne by the Hon. Charles S. Morrill, of Lincoln, in that State. While the most notable investigative work has been done by Professor Barbour, the Daemonelix beds have been explored by other scientists of high reputation -among them Mr. Darton of the U.S. Geological Survey, Dr. Scott, of Princeton, and Drs. Riggs and Farrington, of the Field Columbian Museum, Chicago. 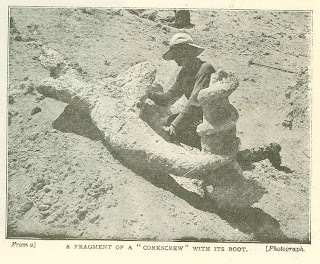 Neither time nor money has been spared in pursuing the investigation, which has resulted in tracing the peculiar fossiliferous forma­tion over the western half of the Nebraska into Wyoming. Originally published in the Strand Magazine. December 1899.